A small whiteboard to go with every reaction. Contains Shutdown information and other Safe Operating Information / Conditions. Information on using the SOCs from Professor Jennifer Laaser. 1. SOCs should be laminated with heavy lamination (the bookstore print shop will do this for $2/card); students can then write on them with a sharpie and clean them off with ethanol when they are done. 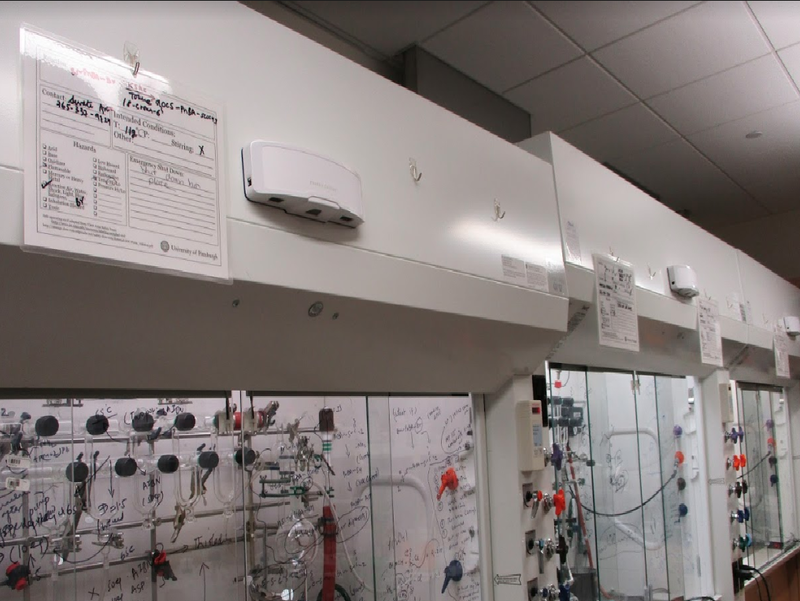 To make it easy to hang SOCs, we have found that it is easiest to hole-punch the top of the cards so that students can hang them on hooks installed above the hoods (we just used the 3M sticky hooks). I’ve attached a picture of what this looks like in our lab. a. This gets students in the habit of assessing the hazards for every reaction they run, and helps prevent complacency. b. If a safety incident occurs that requires long-term building evacuation and/or building closure, EHS and emergency responders need to know how to safely shut down all of the reactions that are left running when people evacuate. This is not a situation students can anticipate, and may happen even when they are in the middle of a reaction they intend(ed) to babysit the entire way through. 4) Also correspondingly, students should be trained to write out their SOCs before they start setting up a reaction. That way, if there is an emergency part-way through their setup – or even if they decide to wander off and get lunch – it is clear what is in their hood and what the hazards are. 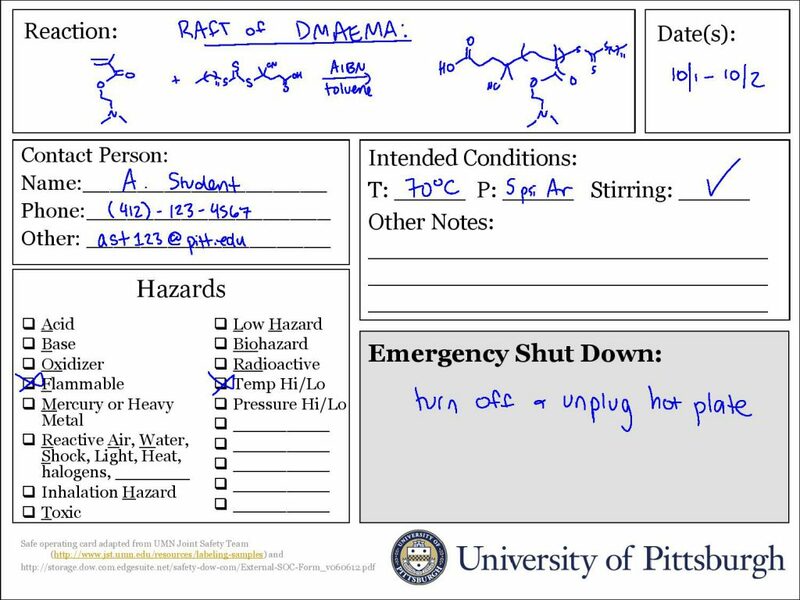 As someone who has been through an emergency situation in which figuring out how to shut down reactions left running during a building closure was an issue, I strongly support department-wide adoption of SOCs, and am happy to help other groups at Pitt figure out how to implement them in their labs. An EXAMPLE SOC used with a polymerization reaction.